MIYAMOTO Yuriko traveled to the Soviet Union in 1927 with her partner YUASA Yoshiko, a well-known scholar and translator of Russian literature. Both Miyamoto and Yuasa were involved in Japanese socialist movements and took a great interest in Soviet culture, particularly Soviet cinema. During their stay they developed a close friendship with Sergei Eisenstein. In Soviet Russia there are places called “workers’ clubs.” These are “clubs” held in a worker’s neighborhood that anyone can come to after their own work is done. These “workers’ clubs” are not directly affiliated with factories. Some are built by labor unions, but these labor unions’ “big clubs” are not associated with factories either and are centered in one area. These “big clubs” are for the use of the people who live in that area (workers, naturally), even if they’re associated with a different union. For instance, if in one area there is a large metal industry “club”, the textile workers who live in that area can also use it. According to the current Five-Year Plan, in the construction of socialist towns, large factories are to be built at the center with these “clubs”, canteens, hospitals, schools built around them to naturally create harmony between labor unions. 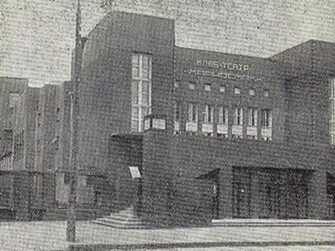 The answer to how workers’ clubs came to be is that inside factories there are “little clubs” where music, literature, cinema, theatre, political seminar room, and a library room are held. There are also “Mother and Child” rooms where female workers and wives can have meetings, watch films, and listen to lectures, all while their children play. The big clubs have gymnasiums, swimming pools, large stages for drama, military training halls, radios, ping pong tables, clinics (particularly for giving information about prevention of venereal disease), library rooms, canteens, even foreign language classes and so on. It is the same on the collective farms, where it becomes a big thing at harvest time as they live a “camp” lifestyle, and part of the “camp” is the “club”. They have the use of a radio, a reading room, a camp newspaper publishing house, and a motion picture group. The films at clubs are for film groups which study and critique films, always meeting to critique. It is terribly cheap to project a film at a “club”, so Soyuz Kino’s mobile unit show films specially made for the clubs. Everyone critiques these films quickly, making Soyuz Kino’s activity more fast-paced. The biggest “workers’ clubs” are the railway workers’ clubs, and the print workers’ clubs are also big. The projection halls as well have become bigger, some seating over one thousand people. At these clubs, the workers can write their own poems or novels or put on plays, but the ability to make their own films is still not widespread. This is purely for economic reasons, but as soon as it becomes more affordable I am sure they will be able to create their own films. At the larger cinemas, you can see Soyuz Kino technical unit workers with cameras answering questions about the machinery in general and taking apart the machines to show in their free time. While Soviet workers are enjoying these “clubs” freely they are also busy doing the work of the Five-Year Plan.